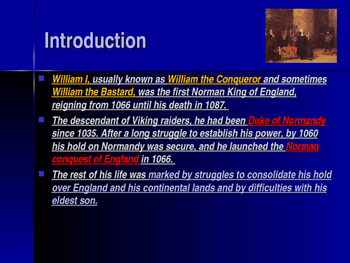 This is a 24 slide, highly animated, power point presentation on The Key Figures of the Middle Ages: William the Conqueror. All the slides are editable so you can modify the slides if you need to. 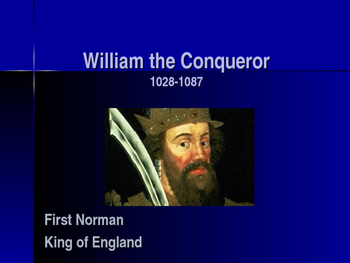 Historians believe that William learned a huge amount about warfare and government through this period of turmoil, and it left him determined to retain full control over his lands. It may also have left him ruthless and capable of brutality. William’s place in English history is assured, as he completed one of the few successful conquests of Normandy, and transforming the makeup of the aristocracy, the pattern of the land, and the nature of culture for centuries. Normans, and their French language and customs, dominated, even though William adopted much of the Anglo-Saxon machinery of government. 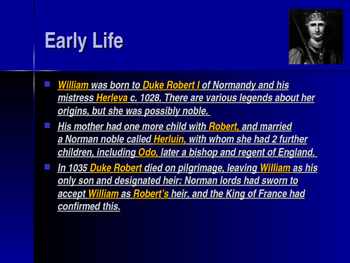 England was also tied closely to France, and William transformed the territory into the most powerful north French holding, creating tensions between the crowns of England and France which would also last for centuries. 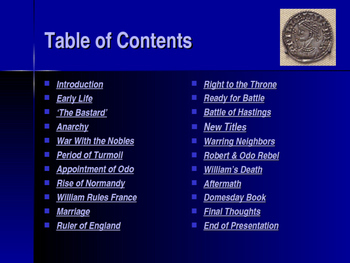 This is one of several power point bundled presentations that I offer in my store on... the Middle Ages.